My gran used to say “if you don’t have anything nice to say – don’t say anything at all.” Needless to say, my gran never had to review Conan and The People of the Black Circle #2. 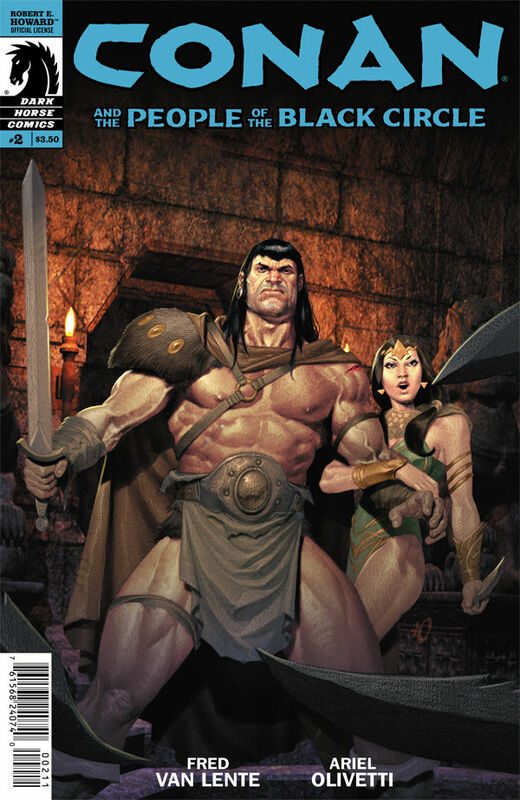 Fred Van Lente and Ariel Olivetti’s Conan mini-series continues – I found last months first issue to be a bit of a let down, given how much I’ve enjoyed Lente’s writing in the past, does the second issue deliver where the first failed? SPOILERS: It doesn’t. Reading this issue I felt like I needed a Rosetta stone of some sorts. The book is wall-to-wall made-up words. There’s Wazuli’s and Zhaibers and Kshatriyas (oh my!) and for the life of me I couldn’t tell you the difference between any of them. I’m sure if I re-read both this issue and the first issue I could probably work it out but I may require the aid of a diagram and a flow chart to help me do so. The book doesn’t go out of its way to aid the reader in following the jargon – a problem that isn’t helped by the cadence and structure of the dialogue. In attempting to make the characters sound exotic and foreign Van Lente has tried to play around with sentence structure to make the characters sound exotic but he hasn’t quite pulled it off. It feels more like a pastiche of Shakespearian dialogue but without any of the required wit. The plot – I honestly couldn’t tell you what happened in this book, or rather I could tell you what happened but not WHY any of it happened nor what the repercussions of those actions could be. Maybe I’m just dumb, maybe I just don’t “get it” or maybe this is just a poorly written comic. I’m going to stick with the latter until someone can prove either of the former. If you’ve been in this comic game for long enough then you know what to expect from Ariel Olivetti. His work is painterly and beautiful but at the same time static and flat. His continued use of digitally rendered backgrounds causes his figures to appear like cardboard cut-outs placed into a three dimensional plane. It’s unfortunate, his characters are expressive and his story telling is dynamic. If only he could transplant that dynamism into the characters themselves then the art could flow, curing it of the rigidity that plagues his work. Top marks to Olivetti for his colouring though, he’s done a great job of placing the story in the location – the tones are slightly desaturated, giving everything a washed out, sun-bleached look that fits the middle eastern location like a glove. I wanted to like this book, I really did but a stick is a stick and a bad comic is a bad comic. No amount of good will on my part can change that. It’s a shame, I know Van Lente can write good comics but this just isn’t one of them. I’m still itching for a Conan fix in my monthly schedule so next month I might tackle the ongoing series – hopefully it’ll deliver the goods!